Razor Digital Entertainment sent me a screening copy of "SuperGuy - Behind The Cape" on DVD. Originally released in June 2004, this is the first time I'd heard of the film, but I was highly impressed. What if there really was a man that could fly? What if there really was a Super Hero? What if he didn't grow up in the best of families? What happens after the parades? 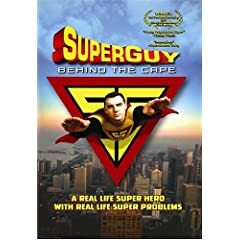 "SuperGuy: Behind the Cape" takes the viewer behind the scenes and into the life and times of SuperGuy, AKA: Mark Trent. Through news clips, interviews, commercials, appearances, file footage, and releases from SG, Inc., we get a glimpse at his personal life and take a long hard unforgiving look at society's reaction to this phenomenon. SuperGuy is not perfect, and he cannot live up to expectations. He cannot catch a break. From being compared to Superman to not being able to be everywhere and save everybody, his life becomes a super mess. We see where the dream turns into a nightmare and watch as his life falls apart, taking society along with him. His only true arch enemy turns out to be the American Public, as they all but crucify him for "Doing Good." In a world that desperately wants to believe in something, in a world that desperately wants to look up to someone, in a world full of despair, victims, and wackos, he fits right in. More information, including a trailer, video clips, and photos are available at the SuperGuy official website. You can also purchase the DVD from Amazon.com for only US$5.99!! I highly recommend it. The production values are quite good, but most of all it's a great laugh.